Starting today all GRM products are on promo where you can save up to 60% off. If there was a time to “Expand Your Mixing Palette” this is it! 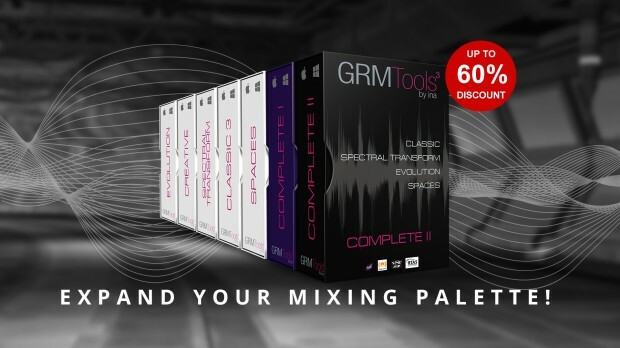 The GRM Tools Complete II Collection is a set of 18 amazing plug-ins that have been used by most renowned composers and sound designers around the world. The GRM Tools Complete I Collection contains 15 plug-ins and can also be used as Stand-Alone applications. Each GRM Tools plug-in offers powerful and unique sound transformation and audio processing features. GRM Tools Evolution is perhaps the most original and unexpected piece of audio software you will ever encounter. Try it out. Spaces is the latest “GRM Tools” bundle that contains 3 effective multi channel plug-ins that let you take control of how your sound sources move through the sound field whether it is a simple stereo file, a Multichannel setup or a multi-speaker diffusion network. GRM Tools Classic is an unescapable bundle of eight audio plug-ins that offers powerful audio processing and creative sound design features used by renowned artists and sound designers around the world. The GRM Creative Bundle is a handpicked collection of some of their famous plug-ins, Delay, Evolution and SpaceGrain which enables the generation of up to 100 ‘ grains’ and then place them in an animated multi-channel sound space. This entry was posted in DontCrack, Plug-ins, Promotions and tagged audio processing, creative plug-ins, GRM, GRM Creative Bundle, GRM Spaces, GRM Tools, GRM Tools Classic, GRM Tools Complete I Collection, GRM Tools Complete II Collection, GRM Tools Evolution, GRM Tools Spectral Transform, Sound Design, sound transformation. Bookmark the permalink.